Residents of Iqaluit are now able to access food banks every week, as the Islamic Society of Nunavut is launching the city's second food bank — the Arctic Food Bank. The new will location is to be open every two weeks, similar to the current Niqinik Nuatsivik Nunavut Food Bank. The two food banks will open on alternating Saturdays, meaning that Iqaluit residents will have a food bank open each week. Muhammad Wani, the society's vice president, said opening the new food bank means low income families in Iqaluit will be able to access food on a week-to-week basis. 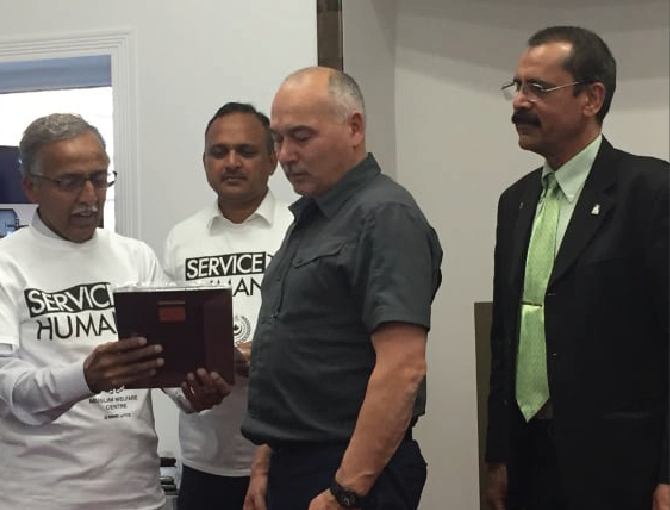 "We are striving to provide services to the underprivileged communities in accordance to our faith Islam and the Canadian integrative spirit," said Wani at the food bank's opening on Sept. 28. The food bank will begin to provide Iqaluit residents with food on Saturday. Wani added the initial goal is to provide enough quality food for everyone. The society has partnered with the Muslim Welfare Centre in Mississauga, Ont. to establish the food bank. Muhammad Iqbal-Ali. the vice-president of the welfare centre, spoke during the opening of the food bank. He said the City of Iqaluit has been very supportive of the group's vision to open a new food bank. Iqbal-Ali added the welfare centre has received a warm welcome from the community. His goal is to help residents whenever they're able to, he said. Wani said the Islamic society hopes to work towards providing residents in need with other essential items next. "We are committed to serving all of those in need, irrespective of religion, nationality, caste or creed," said Wani. "I truly believe the love for humanity surpasses the demographic, religious and cultural barriers."